The Aleutian 70' is a custom designed, comfortable, robust and efficient 70ft steel hull sailing yacht. A serious piece of kit to take you wherever you desire from the tropics to the edge of pack ice. Global Surveyor was purpose-designed for an experienced yachtsman to sail his family safely and comfortably around the world. She can easily sleep 16 persons yet has been designed so she can also be sailed and berthed single handed. Built to be capable of voyaging to any ocean from the tropics to the edge of pack ice, her versatile and comprehensive design instils confidence and peace of mind. The design brief stipulated an efficient and fast passage maker which was also comfortable, safe and robust, and she excels at each of these attributes. Ideal Uses: Charter Vessel , Cruiser , Cutter , Exploration , Research / Survey , Sail Training Ship and of course a Sailing Yacht. Offers invited. A non turbo charged medium speed diesel engine of between 80-140 HP is preferred. 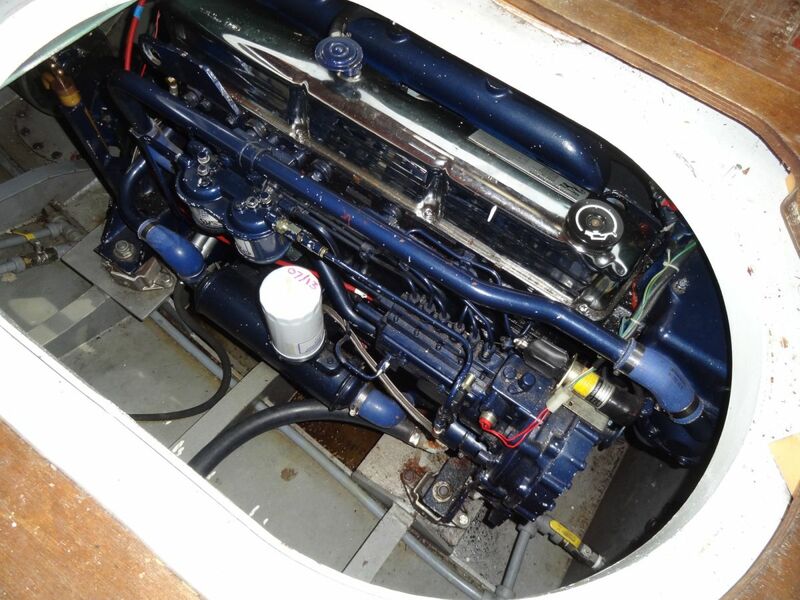 A Mermaid Marina six cylinder naturally aspirated 135 HP diesel fitted with a 2.91:1 reduction gearbox and a thirty inch self pitching propeller minimises drag when sailing. Boatmatch Tip: Want more advice about buying this Aleutian 70 Exploration Yacht? Checkout our Boatmatch Buyers Guide! Large Chart Table and navigation bookcase. Multiple Worldwide Charts and Pilot Books as used on previous Circumnavigation. Fluxgate Compass. Peloris. Spare Magnetic Compass. JRC Radar 3000. 4 KW. 24 mile range. Echo pilot Bronze + Sounder. Raytheon AP20 Electro Hydraulic autopilot. This is very accurate and steered the vessel faultlessly through both the Panama and Suez canals. Icom IC-M411 DSC VHF. Spare 25 Watt VHF. Handheld 5 Watt VHF. Icom IC-725 Amateur Ham Long Range Short wave Transmitter /receiver.. Icom Aerial Tuner. Power Meter. Insulated Backstay Weather Fax connection to computer. 800 W DC to 240 Volt AC power inverter. RADAR: JRC 3000 radar. 24mile range 4KW power. The 600mm diameter raydome gives good bearing discrimination. Mounted 4m above water gives 4miles range to horizon. It has been used to navigate winding and completely blacked out channels in Tonga and to pick up an individual mooring buoy at the end. In normal conditions ships and high land can be detected at 10miles. Keeping the scanner relatively low means that it can be manually levelled when the vessel is heeled, this massively increases the efficiency of detection. 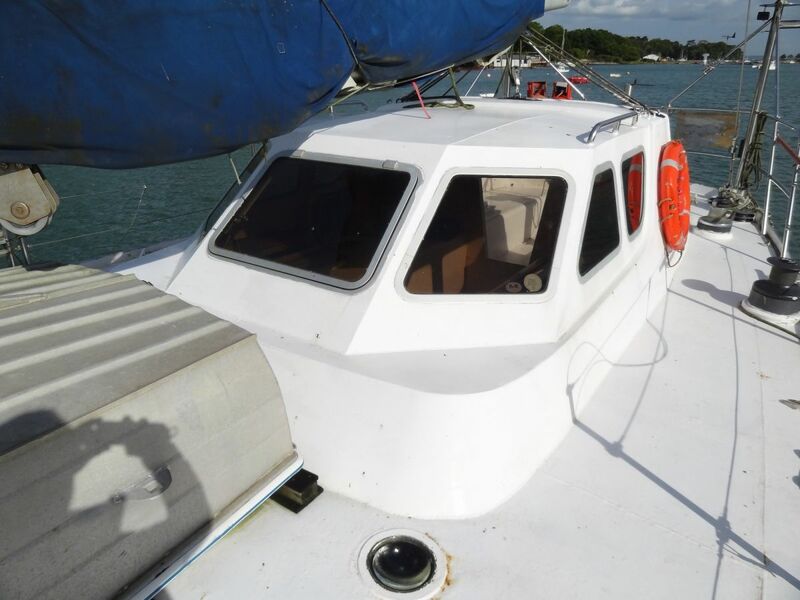 Boatmatch Tip: Need advice about possibly insuring this Aleutian 70 Exploration Yacht? Checkout our Boatmatch Insurance Guide! 1 x 3.9 m Aluminium Dinghy, beach wheels, oars and supply loading davit. Lifebuoys: 4 x ring type. Lifejackets: 16 x XM 150 N Gas inflated. + 15 x Solid + 15 lifebuoy lights. Liferafts: 2 x 8 man. (three year service due) Hydrostatic release. 2 x 10 litre water and 2 x 9kg Dry powder Extinguishers. 5 kg CO2 for engine. Fire Blanket. MAIN MOORING CHAIN: 80m x 16mm. Kedge Chain 10m x 12mm. Also, numerous mooring lines, anchor and towing warps.
. 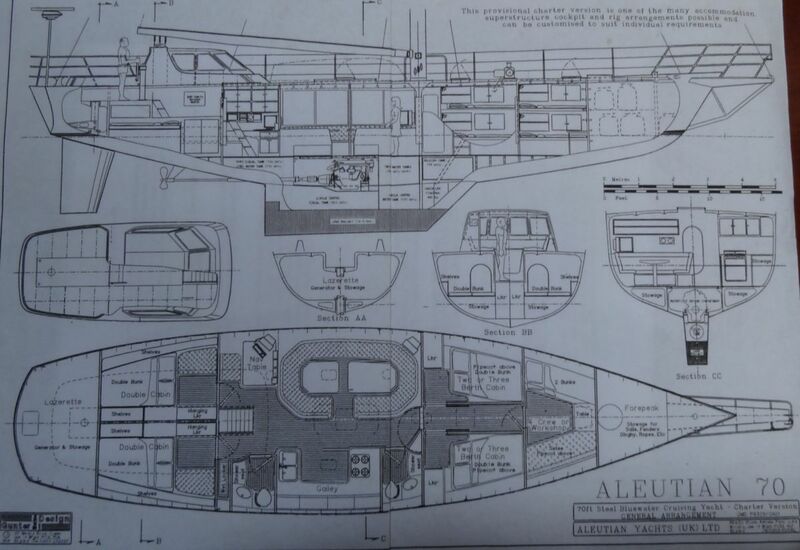 Contact the seller of this Aleutian 70 Exploration Yacht for more details. Rigging & Winches equipped on this Aleutian 70 Exploration Yacht - Very Heavy Duty Main Mast by Proctor. Section 449 x 236mm. Length 23.5 m Twin spreaders. Main and Trisail Track. Usual Fittings. Heavy Duty Boom 279 x 180 mm. 8.4m long. 2 x Aluminium Bearing out poles (for staysail) 7.4 m long. Inner and outer Forestays. Lower, Intermediate and Topmast Shrouds are all 16mm Dyform. 2 x Backstays. 14mm. 2 x Runners. 12 mm. Staylock Fittings. Boom equipped for slab reefing. Lazy Jacks. All running Rigging. Spare halyards to Jib and main. The Spinnaker halyard can be used with the capstan for effortlessly launching the dinghy, loading stores or sending the crew to the masthead. No 1 Jib. 85 sqm . Reef. Anti Rolling Sail 2 sqm. Her 1.5m BOWSPRIT is a wonderful place to watch the dolphins. It reduces the length of mast by an equivalent length and hence the angle of heel. Makes space for an efficient cutter rig. Holds the chain away from the hull when anchored in wind over tide situations. The Panama lead securely holds the main anchor. It produces an excellent fixed point for the cruising chute and for single handed springing off. 1 m high PULPIT & PUSHPIT 900mm x 38 mm and STANCHIONS with 3 guard wires promote a feeling of security and is much more efficient at keeping people aboard than the normal 600mm height. 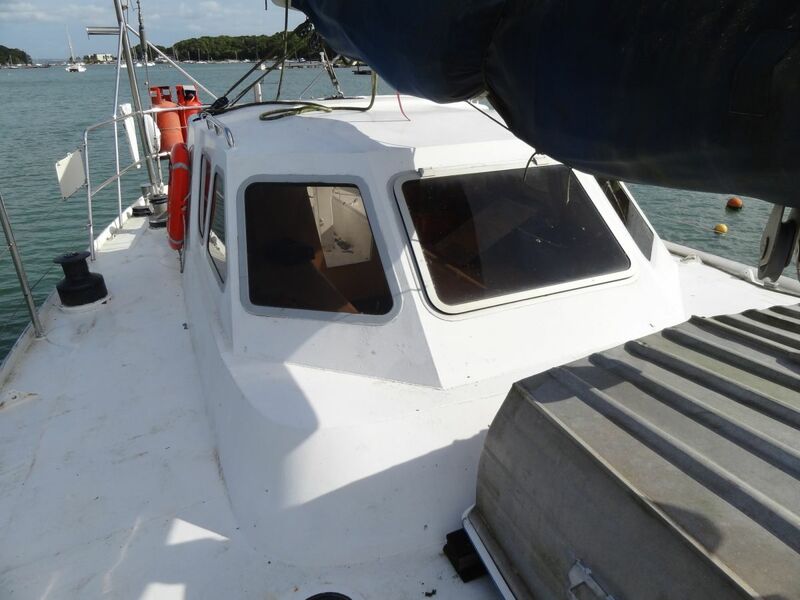 700mm diameter WATERTIGHT STEEL HATCH TO HUGE FOREPEAK provide easy and secure access for ropes, fenders, spare anchors, inflatable and sails which are all kept separated from the accommodation. Heavy Duty MOORING BOLLARDS, CLEATS AND EYE-PADS: Can't have too many. Positioned near the rail to reduce chafe. BULWARK: The whole length is topped by a Stainless Steel wear bar to prevent corrosion. 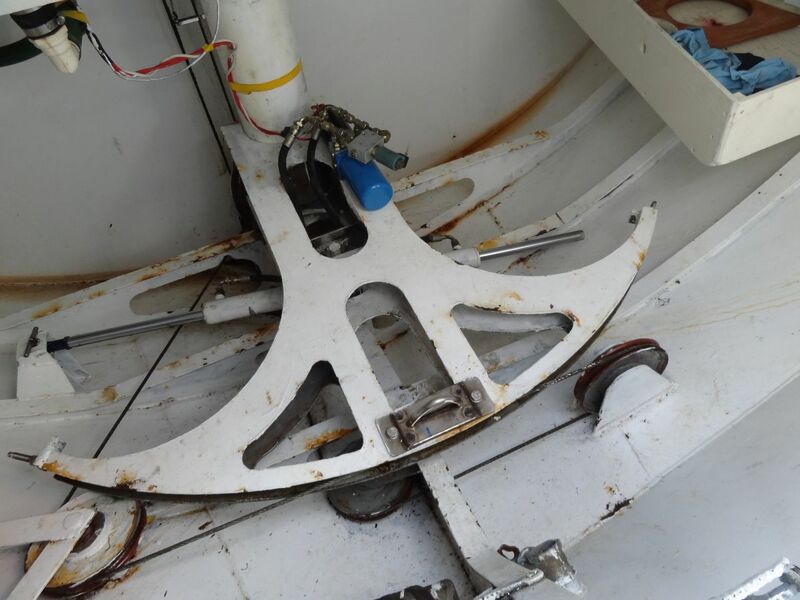 2 tonne Francis Marine 24v ELECTRIC CAPSTAN is used for effortlessly deploying and recovering the self stowing 150kg anchor and the 450kg of chain. The capstan can also be used to adjust any of the moorings, for hoisting sails, crew to masthead, stores and recovering the dinghy. 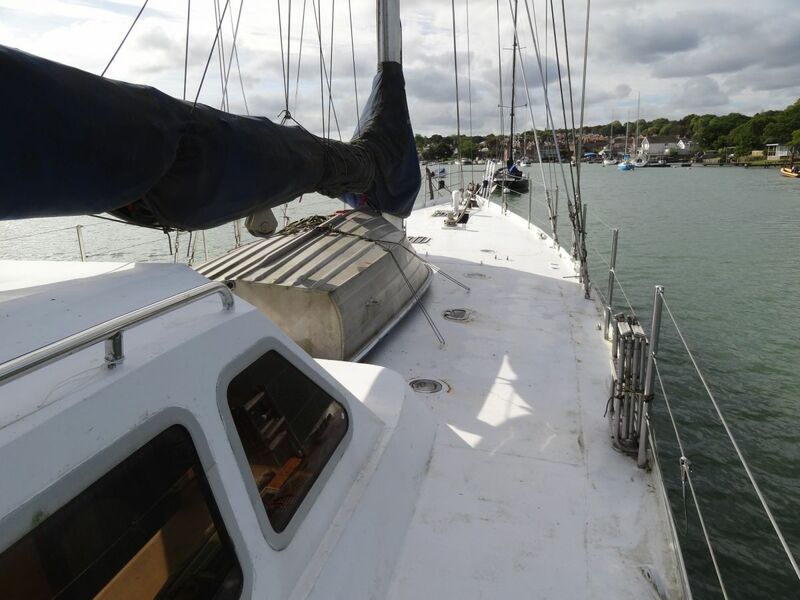 DECK STEPPED MAST: Vastly increases usable space in the accommodation. Prevents any water from getting below. Positioned well aft it gives a large clear uncluttered sun-bathing deck and room aloft for large non over lapping jib and staysail. SALOON WATERTIGHT STEEL DECK HATCH: 1700mm x 750mm positioned vertically above the engine allows its easy removal if ever required. When open in port or in settled weather at sea it gives massive light and ventilation below. It is like having an open top car. (The down flooding angle of this opening exceeds 90°) When closed a secondary 600mm glass hatch gives light and ventilation. The 3.9m SPACE BETWEEN MAST AND PILOTHOUSE can in less clement weather allow the rigid 3.9m aluminum dinghy to be stowed inverted above which acts as a huge “Dorade” ventilator. The LOW BOOM HEIGHT increases sail area and makes it easier to reach the sail when reefing, and furling. The LARGE PILOTHOUSE (2.7m x 2.5m) gives complete protection from rain, spray, wind, and sun. It reduces fatigue and protects from hypothermia in temperate climates and heatstroke and sunburn in the tropics. 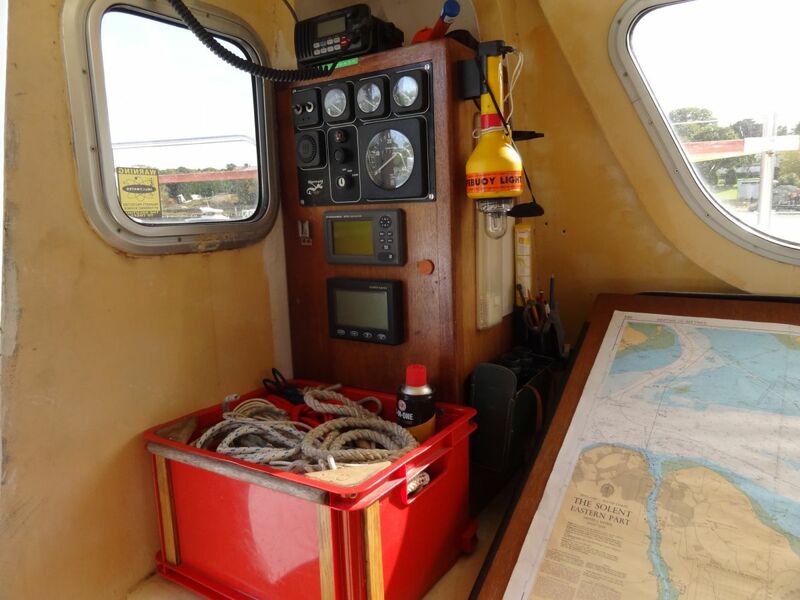 It is a good place for charts and instruments in pilotage waters. 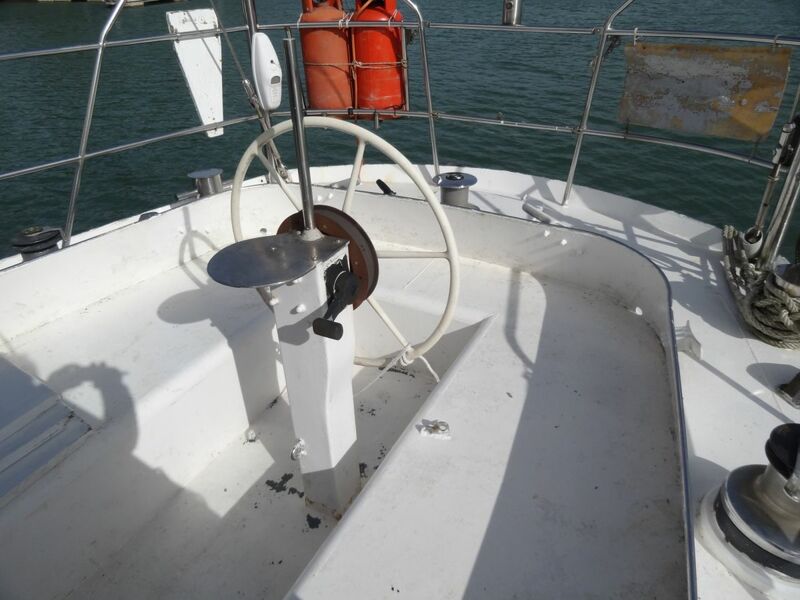 With the sitting position at deck height there is good all round visibility. A lowered floor gives the same view through the windows when standing and reduces the overall height. The vessel has spent 90% of its time under autopilot or windvane so there is no inside helm. The owner believes that if you have to steer, you should be outside anyway. The HELM POSITION is slightly offset giving free passage past and the wheel can be used seated or standing at deck height. This massively increases visibility both ahead and astern. Thoroughly tested trying to avoid 100s of dinghies trying to impale themselves on the bowsprit during Cowes Week. DECK WINCHES: 2 x Messiner 32CL at Mast. 2 x Lewmar 66 ST. 3 x Lewmar 65 1 x Lewmar 48. The FOREPEAK is large enough for all sails, inflatable dinghies buoys ropes and spare anchor. There is a complete watertight bulkhead dividing this space from the living accommodation. The 2m long FWD CABIN has two bunks either side. The top ones can be used as a double. 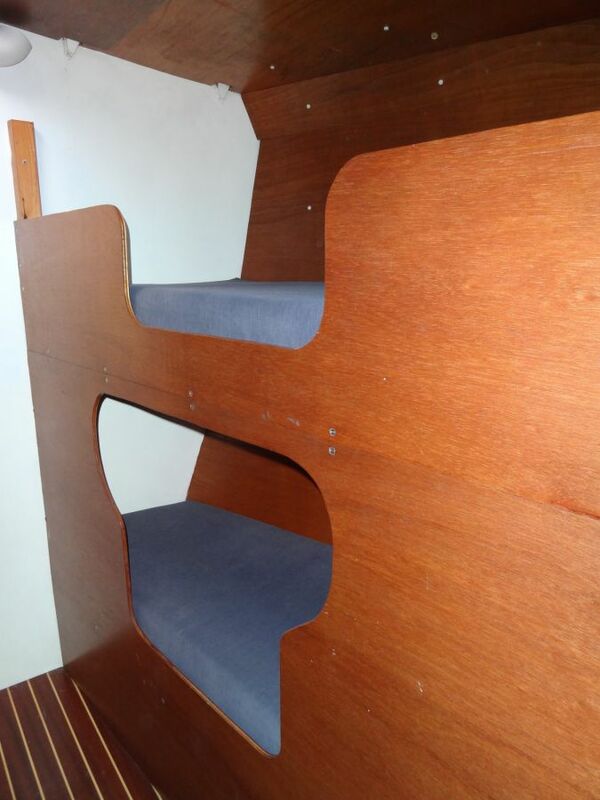 All bunk cushions throughout vessel area are a comfortable 150 mm thick. Watertight door to mid cabin (all watertight doors have been optimised to be 1330mm x 580mm). MID CABIN: 2.8m long. 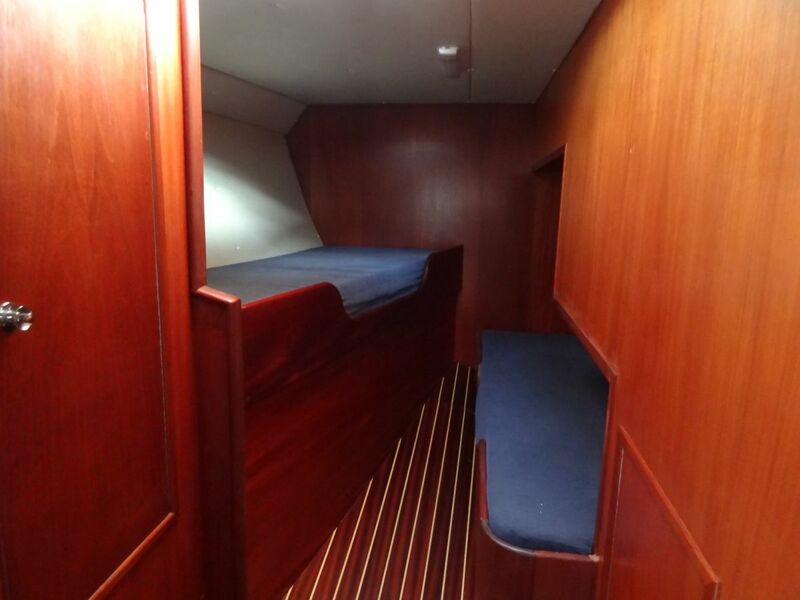 Walk-in owners cabin to Starboard with overhead lockers. 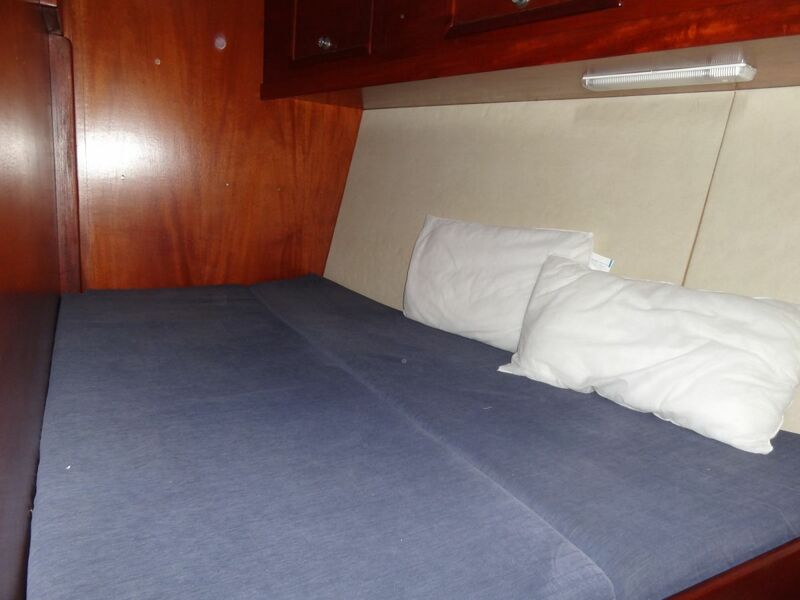 Generous double bunks and toilet compartment on port side. Beneath the floor is space for general stowage and a 300litre holding tank. The 450kg of chain is stowed at the front of the keel to keep heavy weights as low and as near mid length as possible. All floorboards throughout the yacht can be easily removed using a suction pad. Watertight door to saloon. SALOON: 5.6m long. 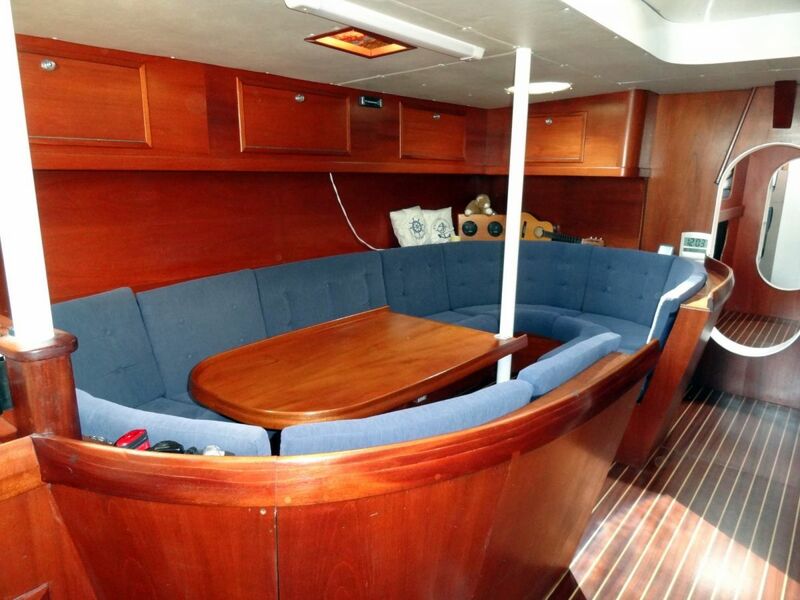 Huge oval settee, saloon table and generous chart table to port. Space for batteries and stores below floor. 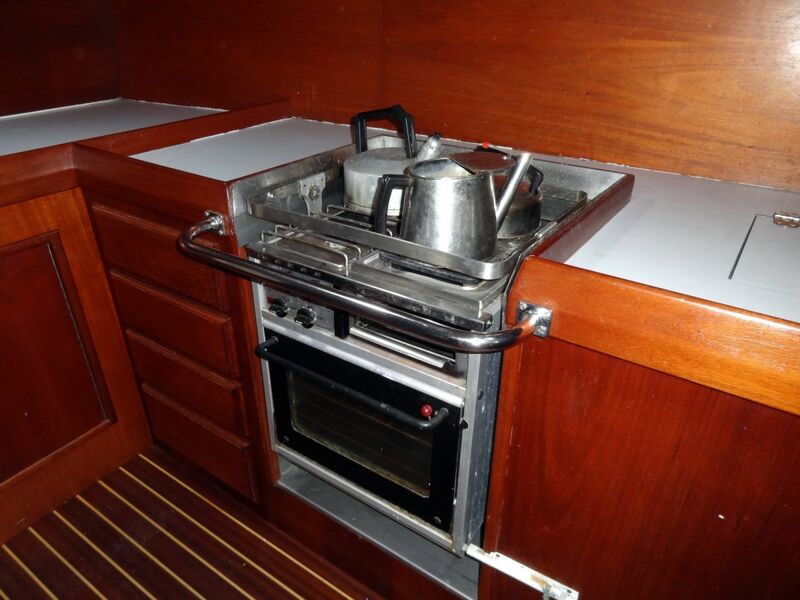 To starboard there is a huge galley space with double sink, 2 huge 200litre insulated cold boxes and a Taylor 041 Cooker, gas alarm, cut off valve. 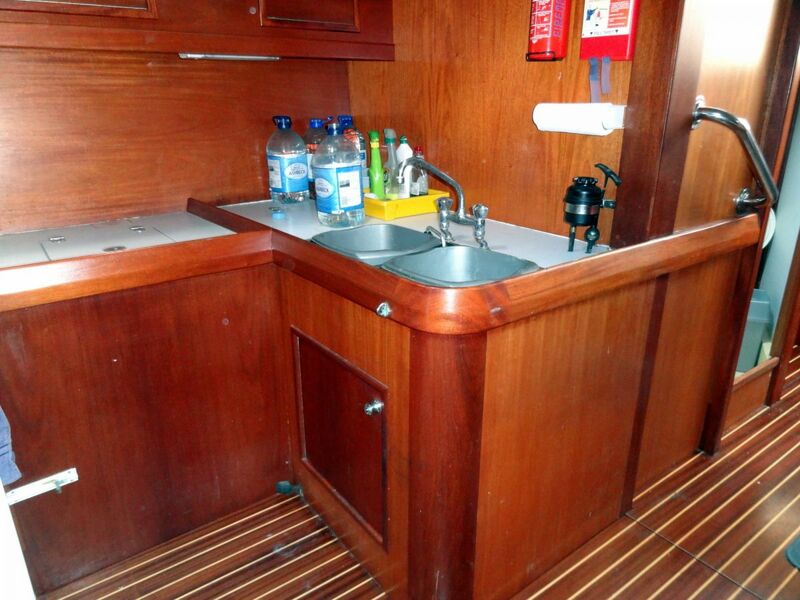 Aft of the galley there is a 1.9 m long main toilet and wet room. There are deck head lockers throughout accommodation, whilst keeping most furniture at waist level to give a tremendous feeling of space. The KEEL is 5m long and 600mm wide so it is highly unlikely to snap off. Small wings at the aft end have made the vessel even more sea-kindly and have reduced synchronous rolling by approximately 50%. The bottom 600mm contains 14tonnes of lead. Then next 600mm contains 1200litres diesel oil, effectively in 2 tanks. 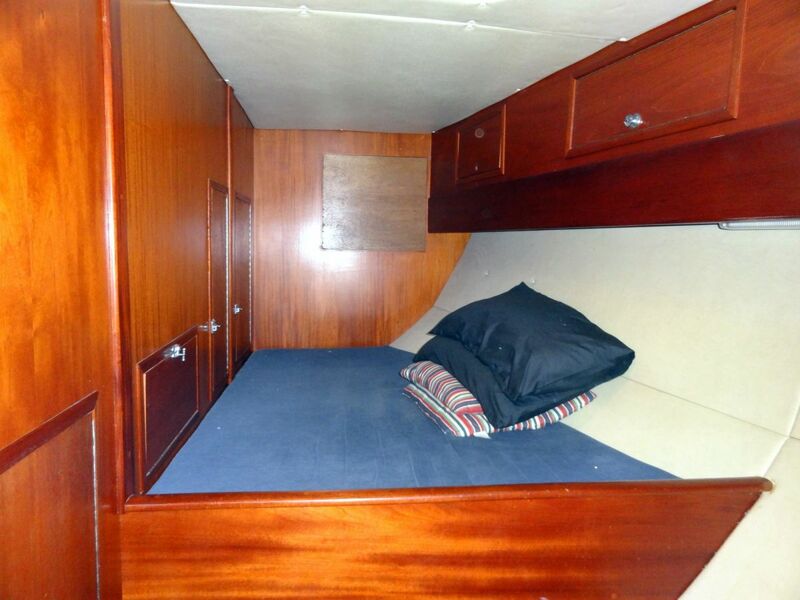 ENGINE ROOM: Takes up zero accommodation space being situated between the top of the keel and the saloon floor. It is easily accessible for routine maintenance from above through two 900mm x 600mm steel hatches For major work the whole steel cover 2.4m x 1.6m can be unbolted and removed. 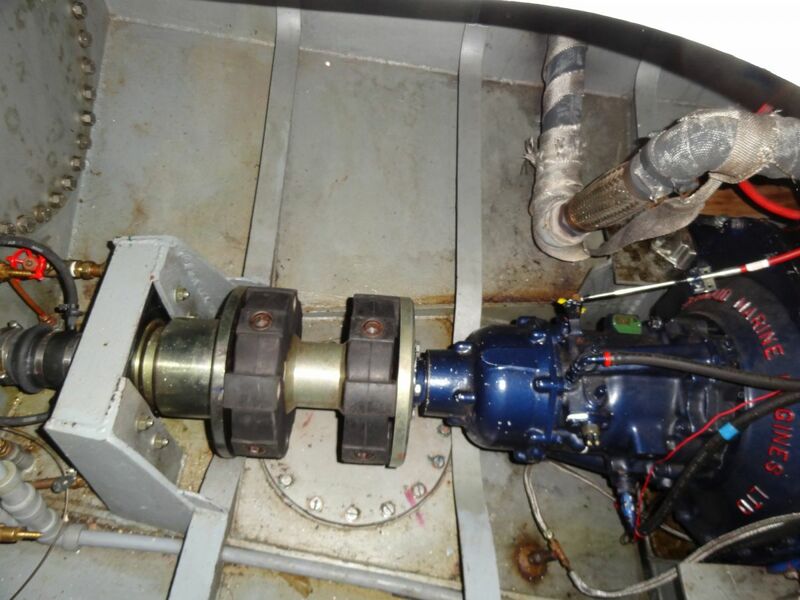 The 135HP naturally aspirated Mermaid Mariner is fitted with 2.91 reduction box a massive flexible coupling, and a halyard seal to shaft. The Fuel is fed through an oversize filter. Filters and fuel pump can be easily bled by slightly pressurising the fuel tank with a dinghy pump. There is a window in the saloon floor which allows easy monitoring of the engine space to detect smoke, fire or flood. There is also a heat sensor and a flooding alarm. 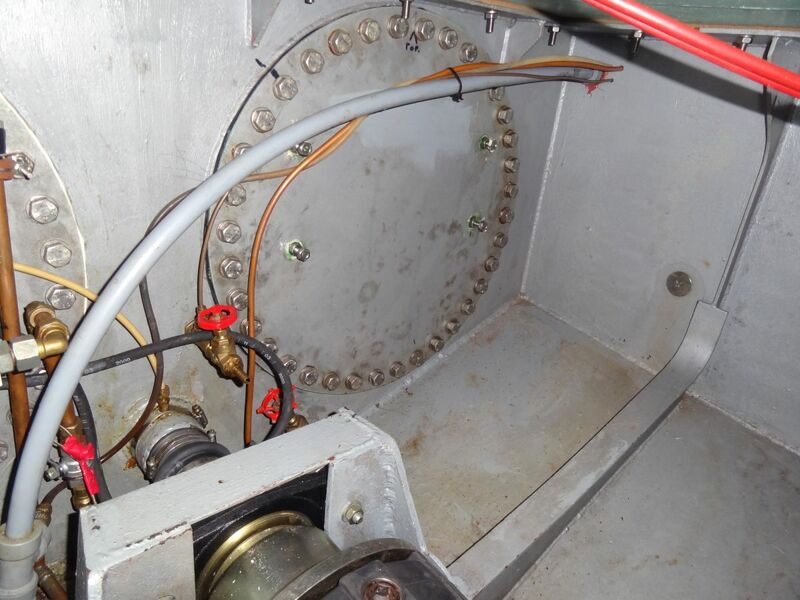 There is only one below-water skin fitting on the entire boat this has a 9mm wall steel standpipe extending 150mm above LWL so is easily cleared at sea without any possibility of flooding (this has already proved vital and worked perfectly). Fore and aft of the engine up to floor level are 4 tanks holding between them 2400litres water and an additional 850litres of fuel. All tanks are accurately monitored by pneumatic gauge. Water tanks can be refilled by rain showers at the rate of 1000 litres per inch of rain. 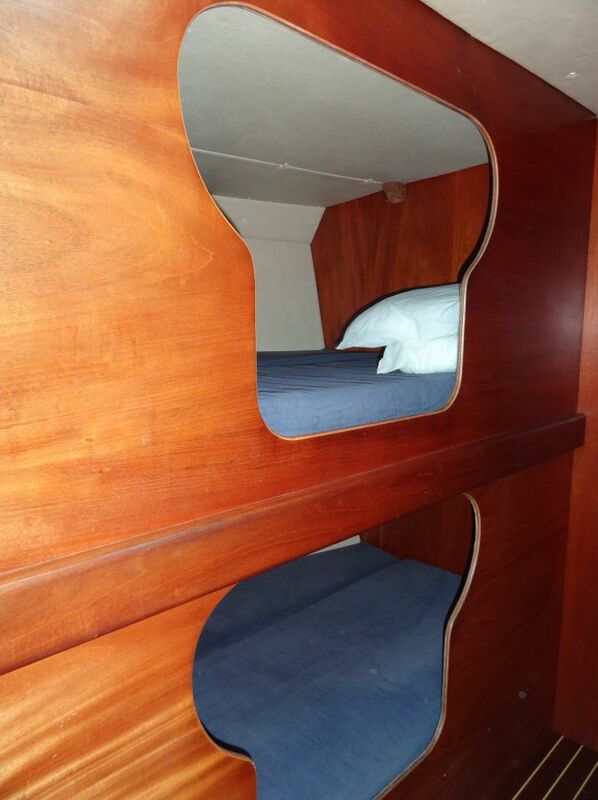 AFT CABINS: 3m long contain two single bunks and wardrobe to starboard, and a generous double bunk to port. There is a watertight bulkhead at the after end and between the cabins. LAZARETTE:. Access through steel deck hatch for Steering Gear, Autopilot and Storage. UNDERWATER: Fine lines at bow prevent slamming. The moderate length fin keel reduces wetted area while setting the lead ballast as low as possible. The base of the keel is 25mm thick with sides of 10mm steel plate giving maximum protection in the event of grounding. 7mm plate below the waterline and 6 watertight compartments gives protection against floating containers or tree trunks. The RUDDER is particularly large which substantially increases directional stability. It is held on an 200mm diameter rudder stock and controlled by a 1m radius quadrant. Maximum Rudder angle has been set to 48° instead of the usual 35° which dramatically improves maneuvering both ahead and astern. If necessary it can be adapted to hold an additional 300litres of fuel. The ENGINE is a 6 cylinder Mermaid Mariner medium speed Diesel. Naturally aspirated 135 HP. 2.91:1 Velvet Drive Reduction gearbox. Drive passes through a very heavy duty Centa flexible coupling and Halyard HMI watertight gland to 30” automatically feathering Max prop. 24 Volt 1000w Alternator and Stirling smart charger. Fuel in 3 tanks totalling 2000litres..
Boatmatch Tip: Have a question about the accommodation of the Aleutian 70 Exploration Yacht? Contact the seller via clicking on the registering interest button above. My Aleutian 70' ocean-going vessel is no toy, and is best described as a "serious piece of kit". Global Surveyor was purpose-designed for a highly experienced yachtsman to sail his family safely and comfortably around the world and is capable of voyaging to any ocean from the tropics to the edge of pack ice. A film has been made about her successful circumnavigation while travelling to out-of-the-way destinations such as The Galapagos, Easter Island, Tonga. Vanuata, Australasia the Seychelles and Red Sea. Air Marine 24 Volt 700 Watt Windgenerator. Servo Pendulum Windvane Self Steering Gear. 3.2m Boat hook Purpose made mooring line. Specialist hooks. 2 x remotely operated mooring quick release systems. BELT & BRACES! 4 Steel support legs which bolt directly to bulwark for added safety when laid up ashore. 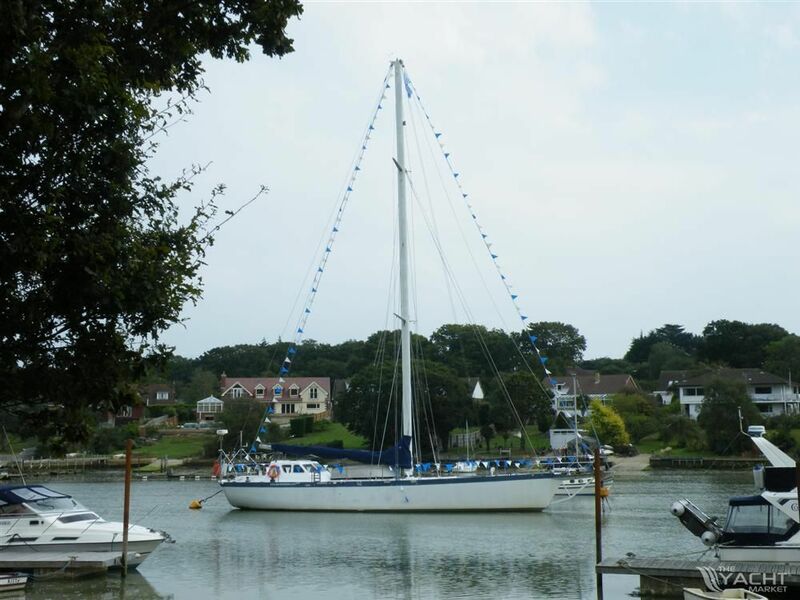 Aleutian 70 Exploration Yacht For Sale is lying in Isle of Wight, United Kingdom. At 21.6 metres (approx. 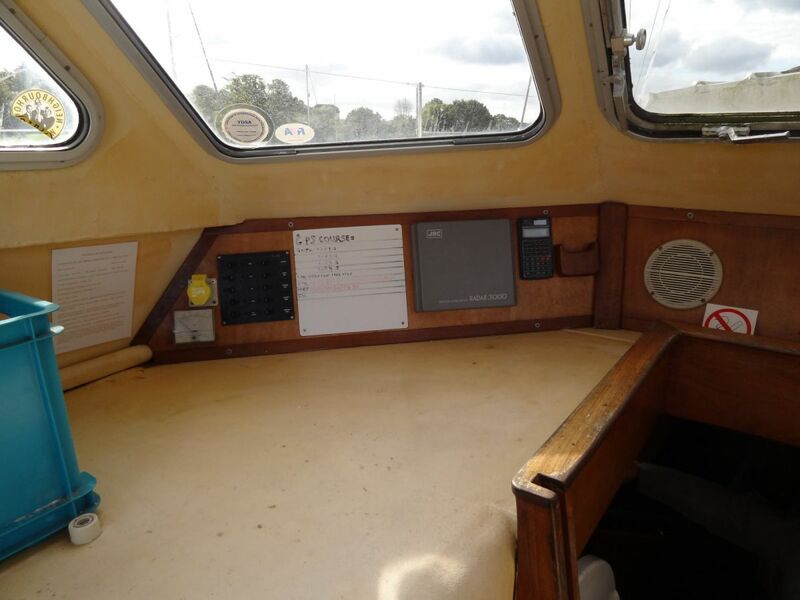 70.87 feet) this Aleutian 70 is a bargain at £225,000.